Should I carry on with the series? These are the collection of my short stories, carrying on from the !TV SERIES! If the first five go down well, I will certainly make another five, and then carry on going like that. The first chapter is very short, as it just brings us up to date. After the great battle with Woundwort, life seemed peaceful again for the rabbits of Watership Down. Hazel and Primrose welcomed in newcomers to the High Hills with their usual kindness; Bigwig and Spartina settled down (somehow) together and had three kittens, named Hawthorn, Meadowbuck and Springfide. Fiver got on very well with Silverweed, and they are never found apart. Hannah moved in with Yona the hedgehog, and still sits on the Down looking out for Keehaar and Gluck. Finally, Blackberry and Campion are the happiest couple you could imagine. “Aha, Dandelion, you fool! You fell for my old trick!” exclaimed Bigwig. “Yippee. Here we go again.” said Hawkbit, rolling his eyes and flopping over in the grass. “Yeah, me too! I’m knackered after that brilliant game.” Dandelion said, and rushed into the warren before he could receive a lecture on bobstones from Bigwig; so did everyone else, muttering an excuse as they went. “Do you want to hear, Hannah?” Bigwig said hopefully. “Not a chance.” Hannah recoiled. “You rabbits stick to rabbits’ games and I’ll stick to mine.” Bigwig sighed, and lolloped to the edge of the Down, and looked out on to the setting sun. How sweet life was. OOC: Sorry if it's a wee bit short, but it's only the intro/prologue. That's okay. I take it you will tell us more about the events following the last battle in the proper story/stories? There are so many questions you can answer and many scenes you could show. For example, how Watershippers deal with aftereffects of war; what do they do about survivors from Darkhaven; how do they pay respects to fallen friends and allies; and so on. Even your own summary raises some questions like why did Hannah moved in with Yona? Let me guess. It's the tilt-your-ears trick from "Orchard" episode? I remember he couldn't stop talking about how he had defeated Hazel with that ruse. Thank you very much for the reply. My stories do explain the aftermath properly; I tried also to hint at why she moved in with her line at the end, trying to show how she had changed slightly. Actually if you're picking up where the series left off I'd be surprised if Silverweed lived five days with the way he looked! The fact that you put that Fiver and Silverweed were never far apart kind of surprised me since I felt he'd be soon dead if the story were to ever continue. That would make an interesting side-story for Fiver since he seemed happy to have a soul brother that understood the foresight, only to lose him. 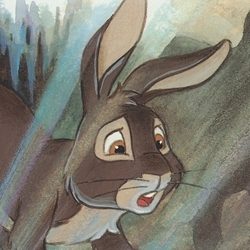 Later on that night, the rabbits of Watership Down were having silflay, almost in the dark. “Should we be eating out here?” said Strawberry, worried. “I think we should let someone else have a go tonight. Something new, say!” replied Dandelion, and Silverweed then piped up; though he had not been doing very well after the Magic had made its mark he was making the most of his time while he had it. “Yes, Bigwig, let’s!” said Pipkin excitedly. Bigwig nodded his approval, and the scarred, ancient-looking rabbit Silverweed began his tale. I came into the world (began Silverweed) about last year, as a hlessi. My mother gave birth to a litter of three, and I was the middle one. One night, we were going through a green field, somewhere south of here, when my mother got herself snagged on a sharp, jagged rock and she cried out with pain, and toppled over. “We can’t stay out here or the elil will come and kill us!” agreed my younger sister, called Feathertail. She was a very small, rabbit; brown with black specks and very wary of the world. We dragged by mother underneath an oak tree, where we went to sleep. We woke up little after frithrise, and we got my mother up on her feet. “Mother,” Blacksin, my older brother said. “We have to find ourselves a warren soon, before we die out here.” Me and my siblings all agreed that we should. “I don’t know if they’d accept me, especially in this state.” She replied. She looked off into the sky with weary eyes, and smiled. “They’d definitely allow you in. I wouldn’t be surprised if they made you Owsla.” I smiled back at her, and knew in my head that she was only trying to be kind to us. We were a frail bunch, and wouldn’t stand a chance in a fight. “That settles it, then,” Feathertail said; young and oblivious as ever to our mother’s niceties. We set off for the nearest warren. “Let me check it first,” my mother said, and plunged through it. We then heard a heart-rending scream. “Don’t come in here!” I heard my mother say. “There’s… shining wire. I have been caught.” Her voice started to falter as it filled with her blood, choking her; Feathertail started to cry, and Blacksin took her in his paws, as I jumped through, and assessed the situation. Her neck had been snagged as she jumped through, and it was plain to see it was cutting through her body. “Don’t you think this story is a little bit too harsh on, say, Snowdrop?” Hazel hovered is paw at the weeping form of Snowdrop, one of his kittens. “I’ll take them up to bed.” Hazel announced, and herded them down a burrow. We heard a voice that moment (continued Silverweed). It was a calm, almost hypnotic tone that could stop an eagle dead in its tracks with one whisper. “Are you in trouble?” The strange rabbit asked, almost levelly and completely unconcerned about my mother’s situation. “What do you mean, are you in trouble? !” I screamed. “My mother’s caught on this blasted shining wire! Help us dig out the stick!” I began to scrabble furiously at the silver pole. “Well then get a move on then, we’re losing her!” I frantically hit the pole out of the ground and began licking her wounds. She gasped for air. “She will die.” The rabbit stopped his silly dance, and stared my mother right down the eye, and she screamed and tried to look away. “I will help you,” the mad rabbit said again. “If you come with me, and stay loyal.” I was furious and I wasn’t thinking straight. My brother was about to protest, but other rabbits leaped out to stop him. My sister, before she died, told me that she thought that their eyes were full of nothing, like their life and happiness had been taken off them. Behind us, my mother gave her final gasp. That was pretty traumatic introduction to Cowslip's Warren. Poor Silverweed. I guess Pipkin didn't expect this story to turn this way or he would have been less excited about hearing it, eh? “But I’m bored, Bigwig.” Pipkin whined. Hazel appeared suddenly beside the grey tufty-haired rabbit. “If you want activity, you can do some young Owsla training.” The rest of the Junior Owsla bounced out from behind Hazel at hopped around the sighing Pipkin. “But I did that yesterday. And the day before that.” The young rabbits stopped and looked downcast. “I thought you loved to train, lad!” Bigwig exclaimed. Blackavar came over to the huddle, and sat down next to Pipkin, and nosed him gently. “I’ll train them.” He said. “I’ve been itchin’ to have a good run around. Being cooped up in that awful place Efrafa made my joints stiff.” The kindly black rabbit smiled at Campion, who had just come out of the warren with Blackberry, and the pair joined Bigwig, Pipkin and the others. “What’s going on here? Blackberry inquired, and Hazel explained that Pipkin wanted to go looking for trouble, which set Pipkin off into a complaint stating that he wasn’t looking for trouble, but just wanted some fun, and then Bigwig nudged him and told him not to be so rude to his chief. Pipkin apologised. “No need Pipkin, we’re just looking out for you and the warren. The last thing we’d want to know is to hear that you were taken by something.” Pipkin began to slink off dejectedly, but Campion stopped him. “You’re always tired, Campion,” A certain Dandelion said, through a mouthful of delicious greens. “Yeah, what happened to your fighting spirit, eh?” remarked Hawkbit as he stuck his head out of a pile of the flayrah pile he shared with Dandelion. He began clawing at thin air viciously. “Yah, I could take you on any day! Look at these moves!” He promptly tripped on a stone and tumbled over head over tail. “Hahahaha, I wouldn’t bet a bobstone on your chance Hawkbit!” mocked Strawberry, popping out from a mound in the down and ran off; chased by Hawkbit. “Don’t listen to those fools,” Campion said jokingly. “The only good advice they’ll be able to give you is how to get into a heap of trouble.” He led Pipkin, Snowdrop, Mallow and Gilia (The Junior Owsla) off the down into the Orchard, where he told them the plan. The breathless Campion called a halt, and when he had caught up with the young rabbits (which took an age) he answered Pipkin’s question. “Is that what your elders have taught you to do?” he said, shocked. Pipkin was instantly embarrassed, but the headstrong Mallow joyfully confirmed Campion’s query. “Oh, yes. Father says that it’s their only plan. If you can call it a - hey!” Mallow recoiled, holding his paw, whilst Pipkin smiled sheepishly. “Now, then.” Chided Campion to Pipkin. “No need to be unkind. If that’s the case, then I guess you’ll have to learn a new technique.” He took them to the orchard where Bark the Badger lived, and was leading them across the needle-covered floor when Gilia began sniffing around. She stopped dead, and whispered to Campion. “I- I think I can smell a- a weasel.” Campion called halt and smelt the air. “You’re right. You’ve got a sharp nose for a young one. Now, keep low!” The five got on to the ground, and began to slink off as quietly as possible. “Hey, what’s that growling noise?” Snowdrop said. “What do you- ah!” Campion was halfway through his sentence when a smooth-furred brown nightmare jumped out at him from a bush, taking him down and rolling off down the edge of the embankment the group were standing on.. Pipkin and the Junior Owlsa stood in petrified shock as they watched the weasel and Campion batter each other. Finally, they came to a rest at the bottom of an apple tree with a bump. Snowdrop screamed and Pipkin began to sprint down the hill. The vicious weasel had hurt his head in the fall, but Campion still hadn’t come round by the time he had come to. He raised his sharp claw and snarled, as frothy saliva dribbled down his ugly, famished features. “No!” Pipkin cried, and in his rush tripped over forwards. He went head over tail, and as the weasel turned his head in wonder he was hit by the madly careering rabbit. Pipkin sat up and rubbed his head, and the Junior Owlsa joined him laughing and smiling. “Good job Pipkin!” Gilia said, and then stared solemnly at the still form of the weasel. “Campion!” The youngsters cried, and hugged him gratefully. “We thought we had lost you there.” Pipkin said thankfully. The four youngsters told him the story as they went off home. “Well it was a lot more exciting than what I had planned for you.” Campion said as they went off back home. But I will be posting at least one chapter per week! That was close one for Campion. Looks like all those skills he gained as Captain are getting rusty these days. Lucky for him, Junior Owsla was there to save the day. Hannah blinked her eyes open as the warm sunlight streamed in to her little burrow. “Wakey wakey, dearie.” Yona the hedgehog said in her usual cheery manner. Hannah made sure to keep away from the hedgehogs prickles and spikes that cover her body, as she woke up and scratched at the sleep that had built up in her eyes overnight and rolled over. “Mind out, Yona!” Hannah exclaimed as a protruding spiketip tore at her flank, narrowly missing. “Oh! Sorry, love,” Yona apologised. The pair crawled out of the burrow in time to see a figure fly, quite awkwardly towards them. “BIRD! BIRD! Run, Hannah! Get in the burrow!” cried Yona as she dived into the burrow, closely followed by the mouse Hannah. They pressed themselves against a wall of earth as they heard the thump of the landing. And a thump it was, for the bird had flown into the tree; roots shook, earth crumbled around the pair as they huddled in anxious terror. “Well, if it is trying to do that, it’s working!” moaned the cowering hedgehog, rolled up in a ball for defence. Hannah had decided that they could not stay cooped up inside for much longer. The bird was circling the tree that they lived under, muttering curses under his breath. Puzzled, Hannah stroked her chin. And with that, she leapt out of the burrow, and into sunlight. Yona anxiously crawled out too. “You remember Keehar, don’t you?” said Hannah, reassuringly. Yona nodded happily. “I do, I do!” she said. “Where’s Gluck?” asked Hannah, obviously worried about Keehar’s soulmate. “Gluck is… at big city.” Replied Keehar. Yona chirped up and joined the conversation. “That’s a shame, I was looking forward to getting to know her more.” Sighed Hannah. “Well, we’ve still got you, my feathered friend!” Keehar nodded happily and they went off to tell the other rabbits on Watership Down. Sorry, if this is a bit short, but I didn't really know what to write. I didn't include the rabbits because I wanted Yona and Hannah to have their own story. I also just realised that I haven't posted in this thread for over 6 months! I will do a grand finale last chapter, and if you think I should write another set of stories please leave a comment below. Any feedback is , as always, appreciated! I just read all of your writing, and I like it! The little adventures presented in each chapter are interesting and fun You also have some good lines in there. I recommend that you continue with this writing, if you have the time! Thank you so much for replying, I am going to continue to write. Any ideas for future chapters in future collections of stories would be great! They pressed themselves against a wall of earth as they heard the thump of the landing. And a thump it was, for the bird had flown into the tree; roots shook, earth crumbled around the pair as they huddled in anxious terror. Seems like Keehar had eaten a lot of fish, if he made earth crumbling with him colliding into the tree. Glad to hear you're continuing! I don't have any ideas...maybe a mini-quest of some sort? Yeh, maybe for the next series I'll do that. What characters should I use? Oh and the last chapter, titled A New Threat should be extra long and out soon!